Laura A. Hansen was born in a suburb outside of St. Louis, Missouri and has spent most of her life in the Midwest. In her day job she is a cancer biologist, professor, and educator, with several advanced degrees including a Ph.D. in Toxicology. Her cancer research has earned international recognition and taken her around the world, including a recent stay in Copenhagen, Denmark. Dr. Hansen has been a professional writer her whole adult life, although primarily as a scientific and technical writer. Cruise of the Undead, published in 2012, was her first young adult novel. Avalanche of the Undead (2013) and Inferno of the Undead (2015) complete the series in which teen brothers, Charlie and Jack, team up to save their parents and stop a zombie outbreak. Dr. Hansen is the mother of two boys, who provided the inspiration for Zombies in Paradise series. She started writing fiction when she wanted to capture the spirit of her crazy kids in that brief and turbulent time between childhood and adulthood – their tween and teen years. 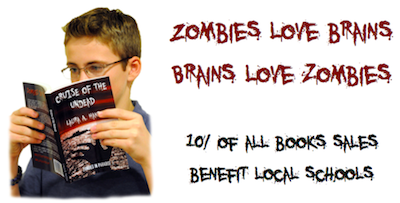 The main characters in the Zombies in Paradise books draw heavily from the personalities of her sons, and various plot elements were inspired by experiences on happy, but zombie-free, family vacations. Dr. Hansen lives in the Omaha metro area with her husband, children, dog, and cat. You can contact her via the Feedback link above or directly at LauraHansenPhD@gmail.com.